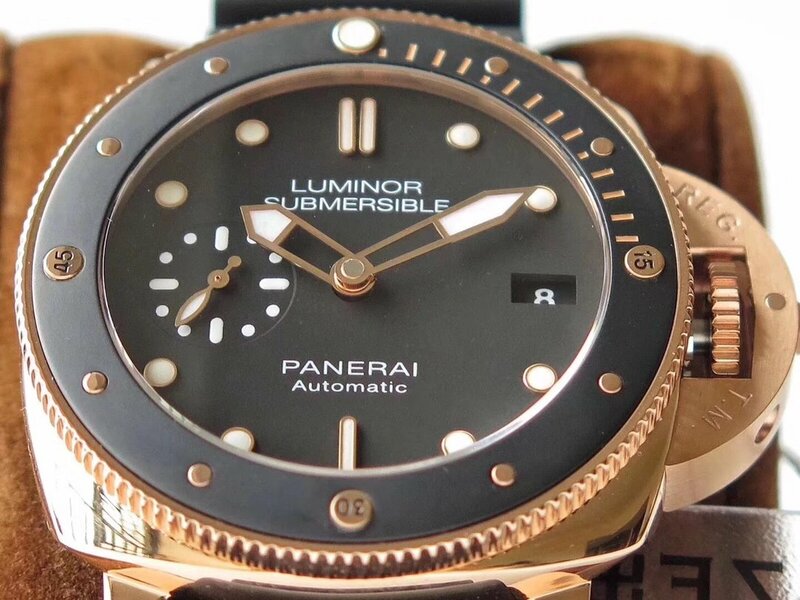 I have introduced several Panerai Luminor Submersible watches before, they are made of stainless steel, titanium or bronze. 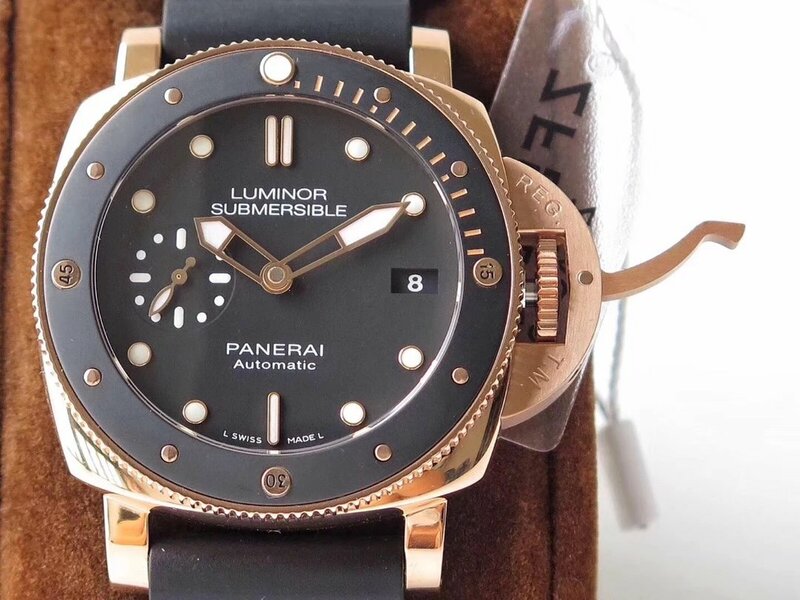 I still did not believe that Panerai will publish a diving model with rose gold case until I saw PAM 684. 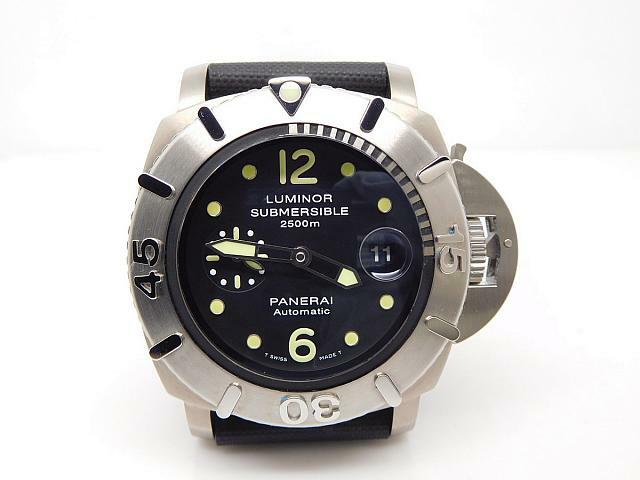 It inherits the traditional features of Luminor Submersible, strong and looks like being specially made for tough men. Yes, I have to admit only strong men with big wrist could master such type of watch. The replica here is produced by Z factory, like V6, ZF also made a lot of good quality replicas like their most famous Portuguese 7 Days Power Reserve. The PAM 684 is also a superior replica that not only features noble rose gold casing, but also has a 1:1 original case profile and superior clone movement. The case is made of 316L stainless steel and has 18K rose gold plated. Case diameter is 42mm, not too big, but with Panerai’s iconic crown bridge, it looks bigger than Submariner. Bezel is uni-directional rotating. the bezel tooth and studs are all applied rose gold coating. 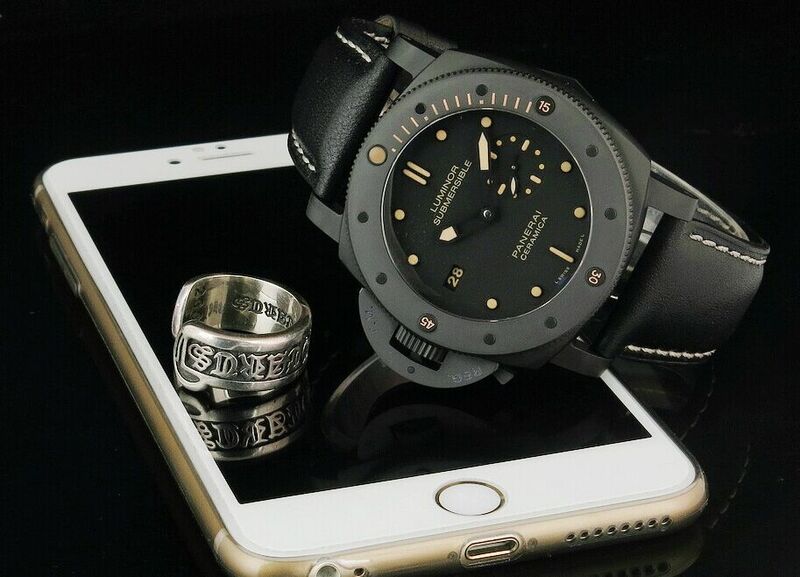 Black dial is protected by a thick sapphire crystal with colorless ar coating, which is Swiss standard. Hour markers have rose gold edge that exactly echo with rose gold case and bezel, markers and hands are applied with Swiss grade Patina Superlume, which will emit green light in the dark, while minute hand and bezel pearl emit blue light. You can check the lume effect at night, it is amazing. Small second hand is leaf-shaped and runs smoothly, no clicking all the way sweeping the whole small dial. Date window at 3 o’clock features white font in black background, which forms a high contrast and gives the wearer a good readability. 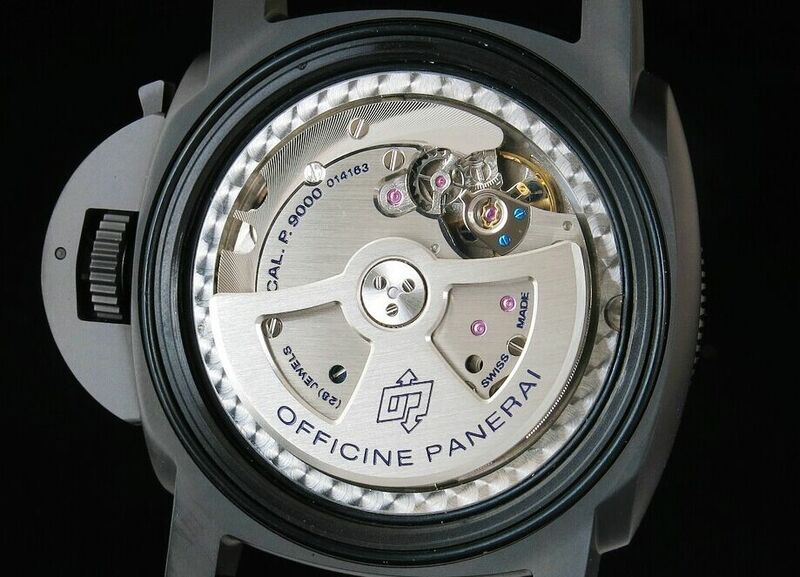 Movement is super copy P.9010 automatic, beating frequency is 28800 times per hour, all movement plates as well as auto rotor are finely polished and decorated to the look of genuine Panerai P.9010. Beautiful OP Logo and blue engravings are exactly the same as genuine, not able to spotted as a fake. One pair of rubber bands are in black and each has OP Logo, it is classic. Rose gold tang buckle has “PANERAI” engraving, whole buckle is fine brushed. On back side of the buckle, there is also an OP Logo engraved. 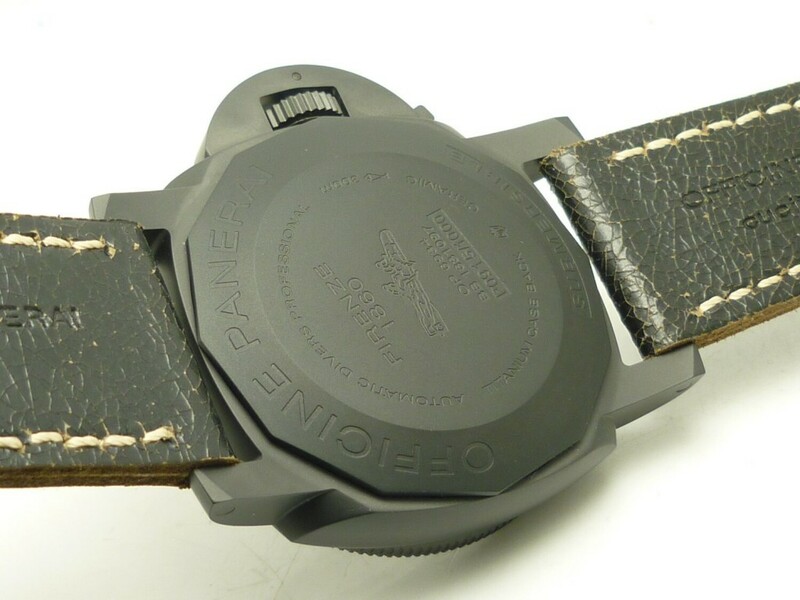 You can get one extra pair of black leather band for free if purchasing the Panerai watch now. It is a long time for me not to write a review here. These days are the most frustrating moments in my life because my company went bankrupt. 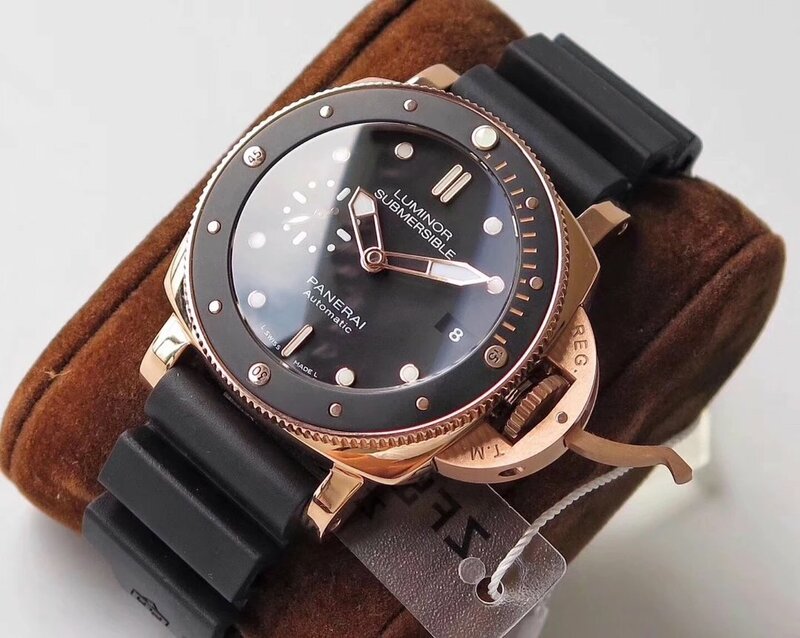 I am really sad, my company deals with replica watches business, and I have been in this area for almost eight years, now I have to sell it to another people, but I will still bring more helpful reviews here for you guys. If you want to buy some watches, please contact me directly through email. I have not gone to watch market for nearly one month, today, when I was there, I found a lot of new models published by various factories. 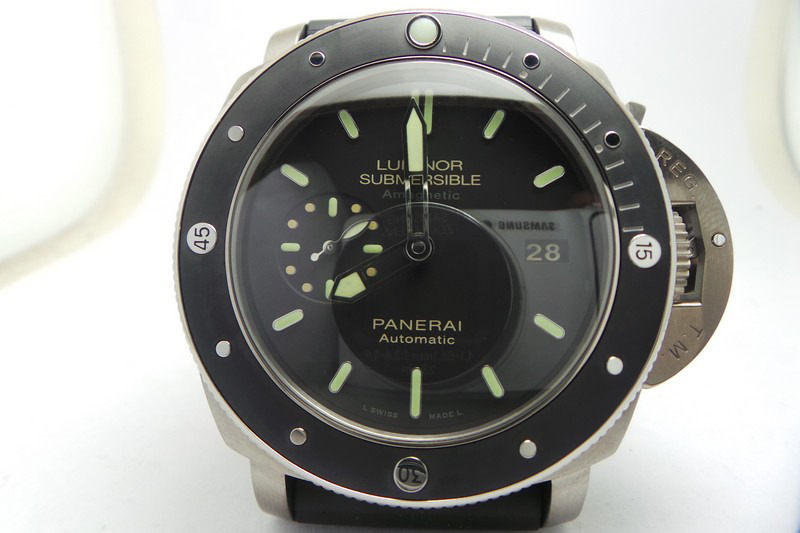 The one I am going to share with you is a big watch, which is a 1:1 replica of Panerai Luminor Submersible 2500m PAM 285. 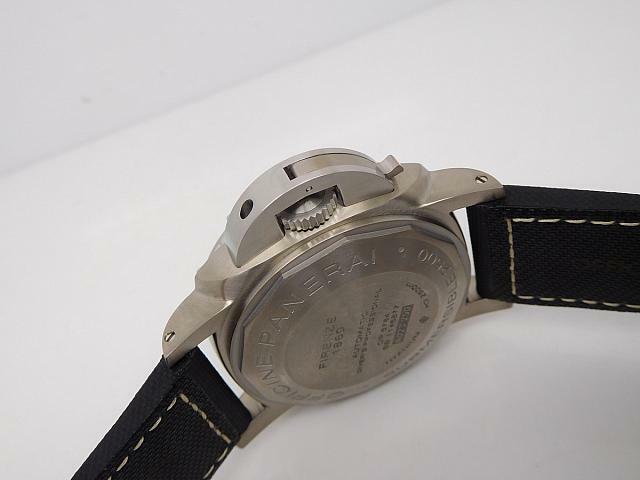 The replica is manufactured by V6 factory, this manufacturer is good at making high quality Panerai replica watches. 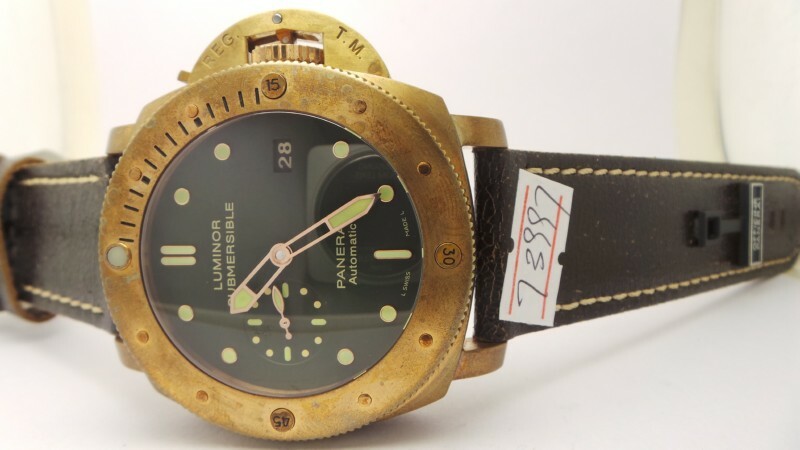 The PAM 285 replica here uses real Titanium material and should belong to the most high end replica watches category. Titanium case is fully brushed. 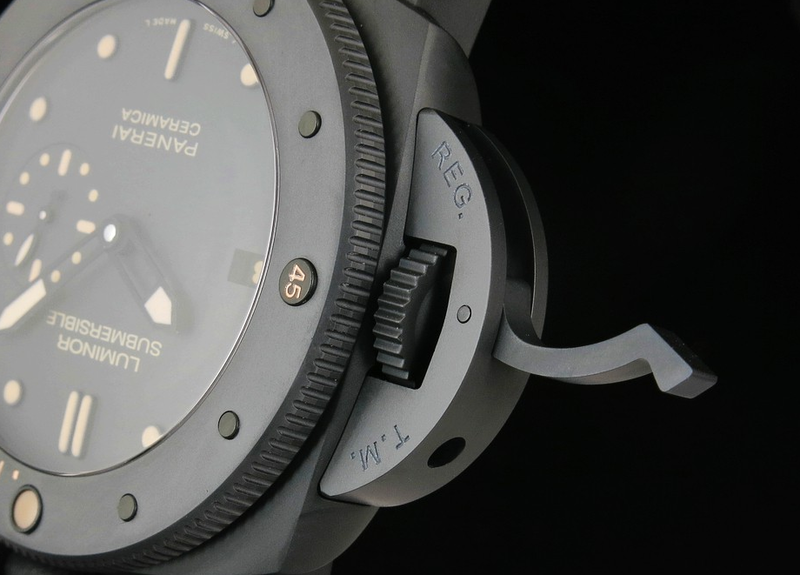 The bezel looks very strong, there are bar-shaped studs decorated on the bezel besides 15, 30 and 45 markers. The bezel click feels very real, the whole case finish is perfect and hand feeling is really good. 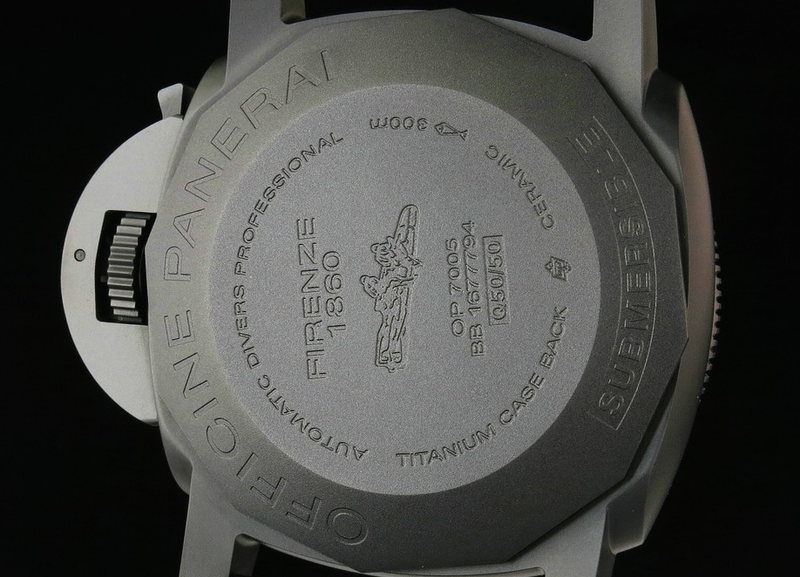 Polygonal solid case back is engraved with “OFFICINE PANERAI”, “SUBMERSIBLE 2500” and other information that tells user the production of the watch. 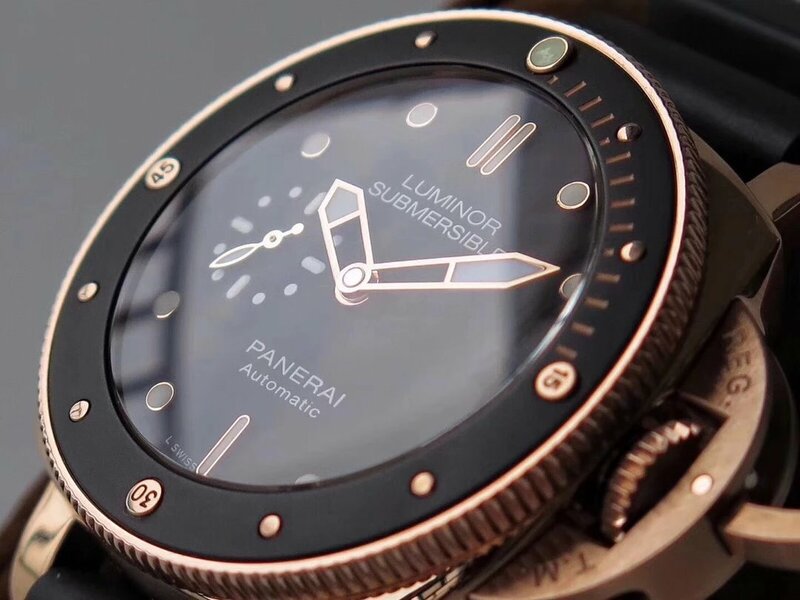 The biggest difference between this replica Panerai Luminor Submersible PAM 285 and other Submersible replicas lies in its watch band and buckle. Check this one, the lining of the band is rubber, while its outside is fabric. Actually I could think that V6 factory only changed a new pair of straps on previous replica PAM 285. 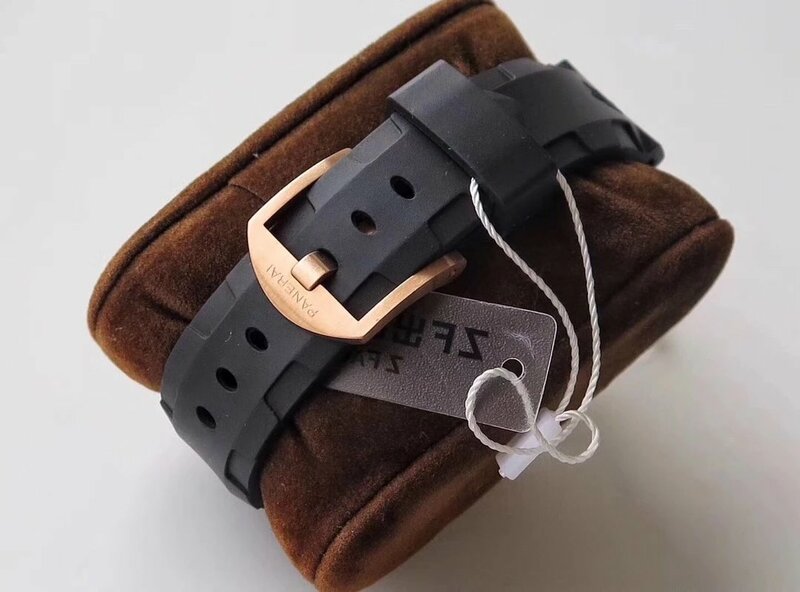 So, if you love Panerai, the biggest fun you can get is by changing its watch band, there are a lot of watch bands in different style. The replica could also be installed a rubber band. The new PAM 285 is fitted with a great clasp, which is different from others’ Pre-V pin buckle. 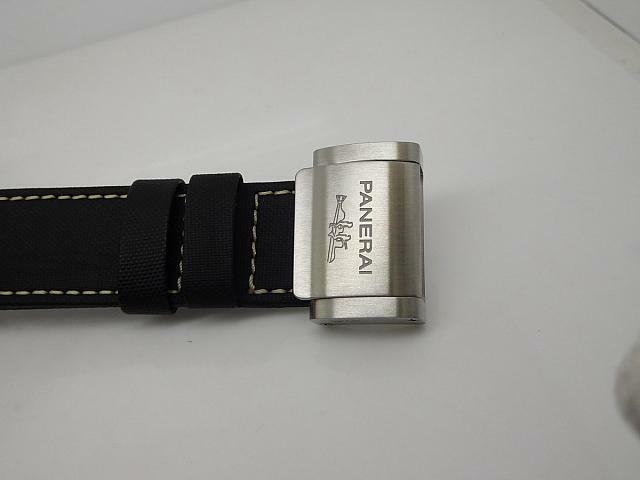 The clasp is engraved with word “PANERAI” and Pig Logo, look very special. Ok, about this replica, if you love diving watch, PAM 285 is a good choice, after all it has several straps options. 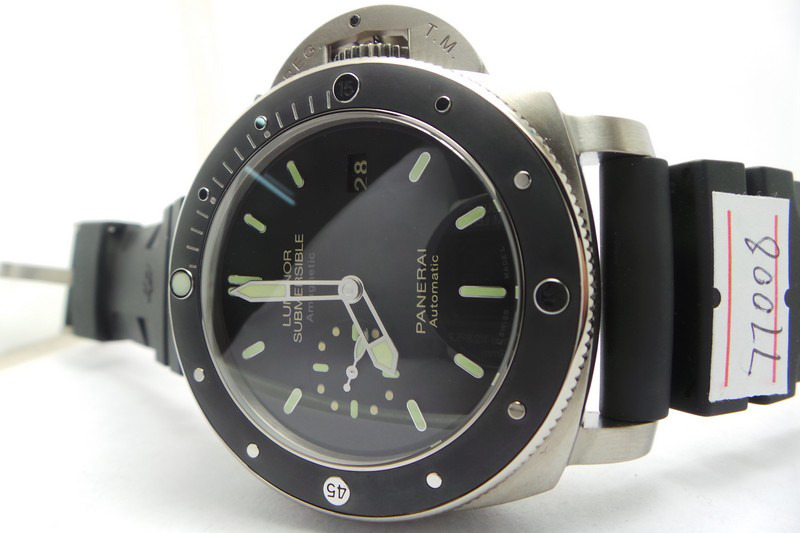 And V6 factory really did well to meet the special needs of Panerai watch addicts. Have you ever seen The Expendables movie series, Stallone and his brothers were all wearing a robust brand watch on their big hand. And in The Expendables 3, a new big face appeared on their wrist, that is PAM 389 from Panerai, yes, Stallone has been a Panerai watch fan for many years, he wore this big brand in many public places and in the movies, but this time in The Expendables 3, PAM 389 was not only worn by him, it also appeared on the wrist of Dolph Lundgren, Jet Li, Rany Couture, Jason Statham and Terry Crews, each of them is tough guy and PAM 389 is exactly built for them. 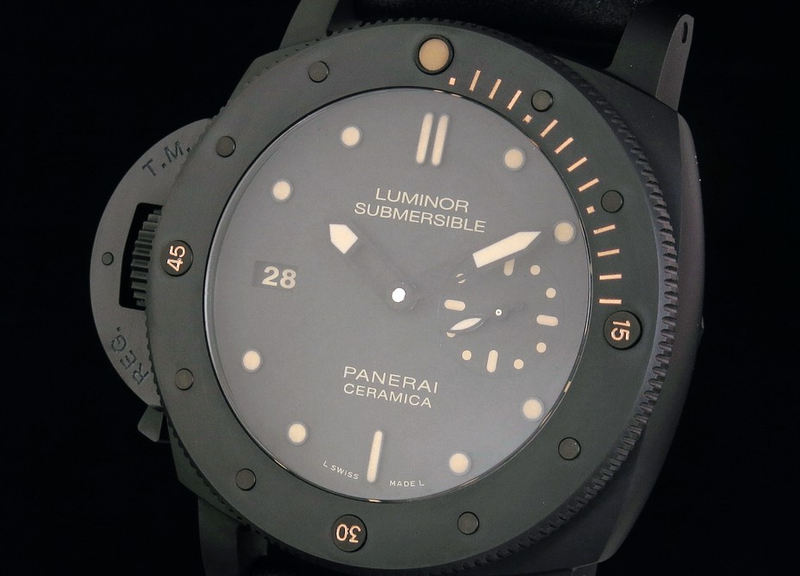 After the movie came to the public, many people loved Panerai and started to accept this large watch. 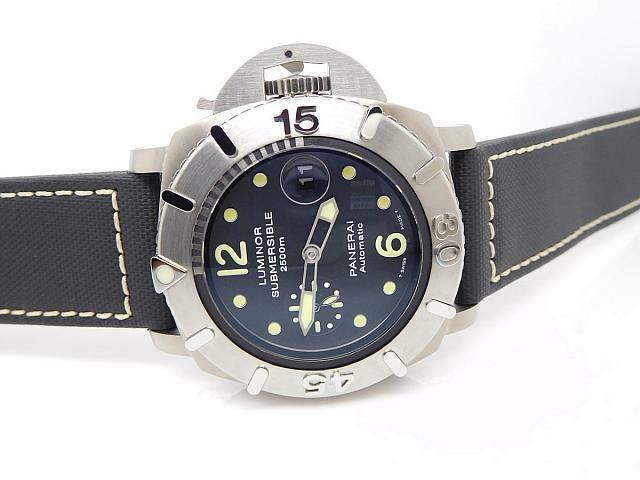 PAM 389 is domineering and exactly fulfill the temperament of tough guys, however, within a low budget, a genuine PAM 389 is too expensive, then they turned to a great alternative, so the factory in our market manufactured the replicas. It is a super replica made with an original watch as sample. These pictures and short review here only give you an overreview of it, you will be shocked by its great quality if holding one on hand by yourself. On the whole, this replica has inherited all advantages of the genuine, here I will explain the details in the following. Panerai PAM 382 Bronzo watch was very popular because it was worn by Sylvester Stallone in The Expendables. So the watch became hot and was pursed by many watch fans. 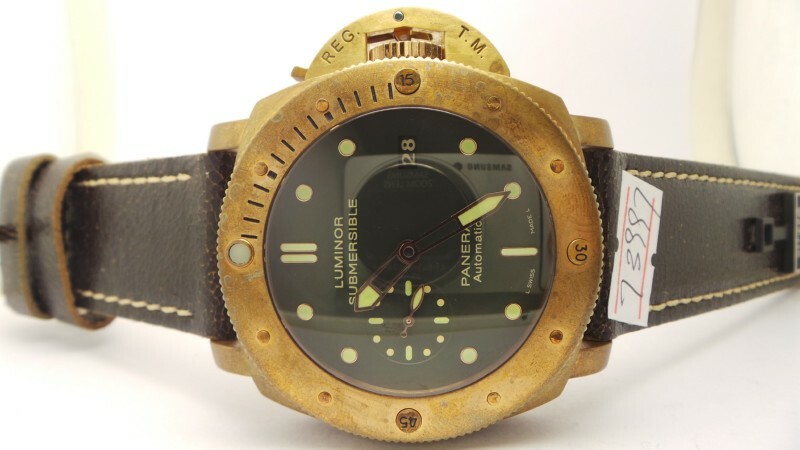 It was the first time for Panerai to use bronze material on case, few brands in watch industry used such bronze material. 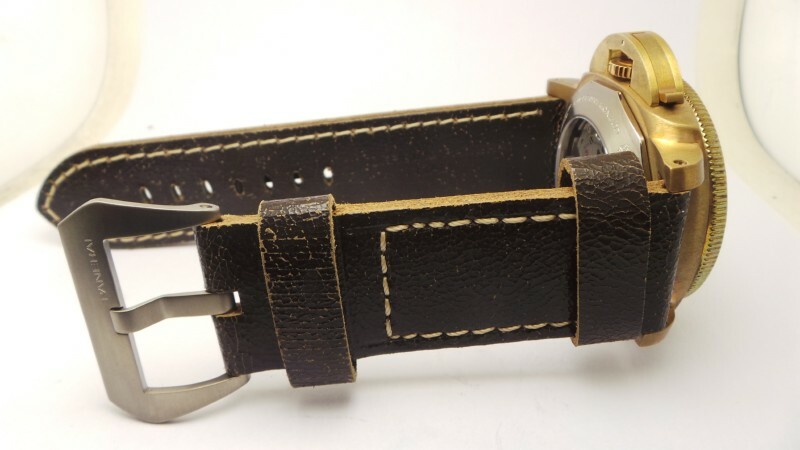 The use of bronzo makes this big guy that features unique crown bridge more special among various types of brand watches. 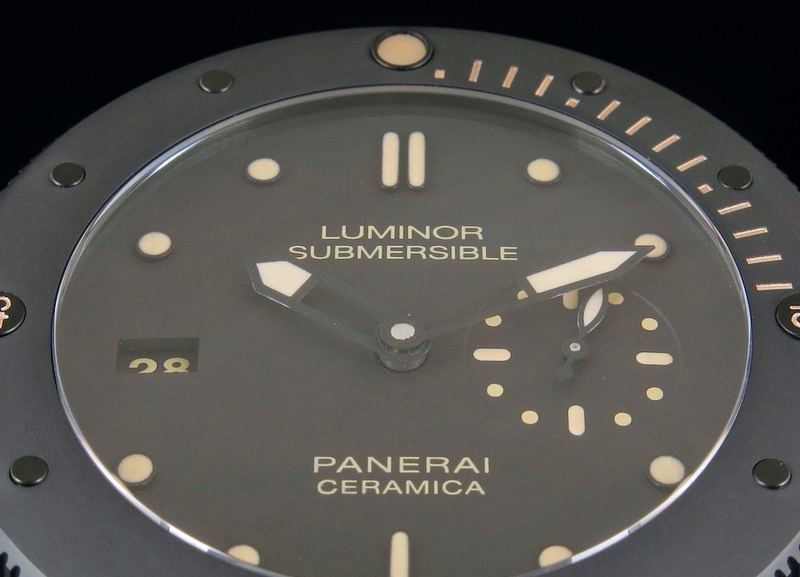 Here comes the replica Panerai Luminor Submersible PAM 382. 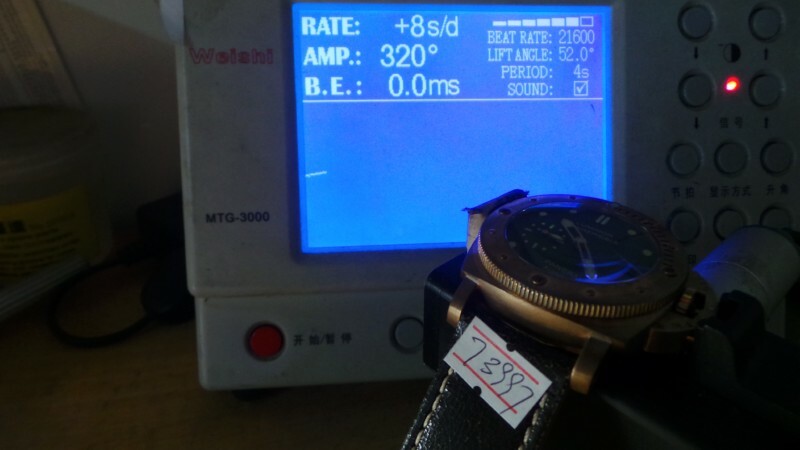 The watch was manufactured by a big factory in our market, with superior quality more than you expect. The case and bezel are all bronze made and brushed, this could resist scratches. 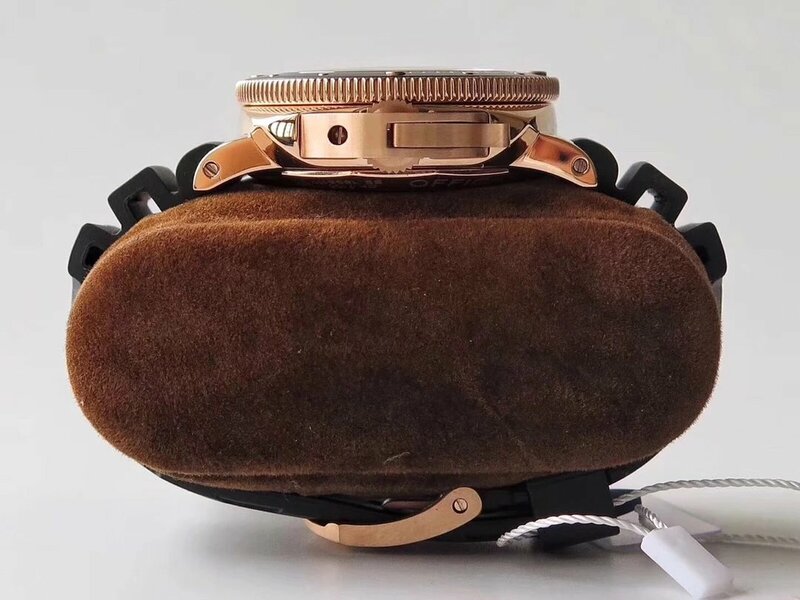 Brushed bronze case is also easier to maintain, if you found the watch darker after using for a long time, you can easily put it in the tomato sauce and wipe on the case around, then wash the whole watch, it will look like a brand-new watch. 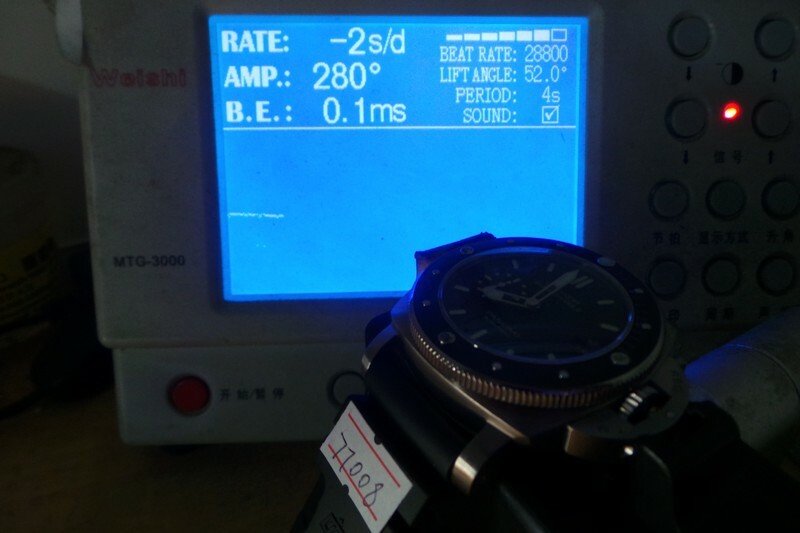 Many wearers of PAM 382 had done this experiment. 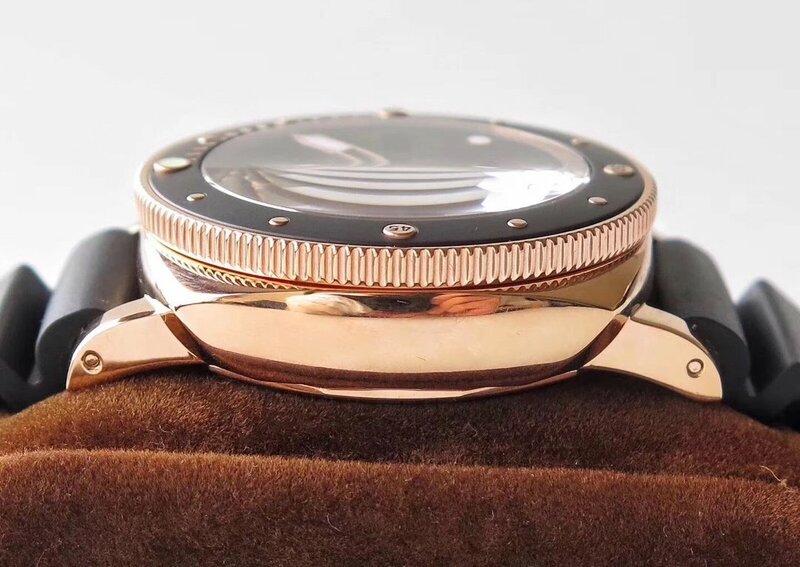 The case of the replica is measured to be 47mm, unidirectional rotating bezel is the diving style I like, all bezel studs have the same height like genuine, the bezel pearl also features correct lume color. You will find the replica watch in an uniform style when seeing its green dial and brown leather strap. Actually green really matches the bronzo very well. The dial is simple and easy to read, small second hand is positioned at 9 o’clock. Hour markers having golden edge are applied with green superlumed material, the whole dial will emit strong green light in the dark. I like the brown leather strap, which is made of high quality calf leather and looks to be perfectly fit the bronze case. With all details such as brownish hand stitching on the band, green dial and brown leather strap, the replica watch is just a virtu featuring the most advanced watch-making materials and technology. Every time you face a replica watch, what things will be in your mind? A fake you look down upon or just an alternative of your genuine watch? 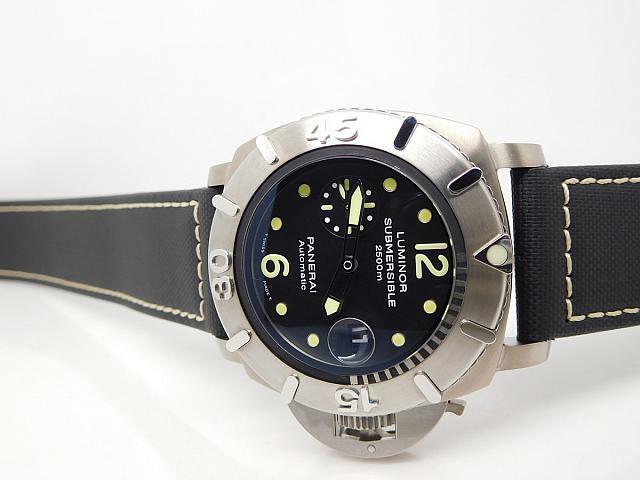 I treat the replica watch as my best friend, just like this big guy below, it will appear on my wrist every day after I bought it two months ago, the watch is a replica of Panerai Luminor Submersible PAM 607, a whole black watch, every thing of the replica Panerai looks good, except the leather strap, which does not fit the big case head very well I think. So I am considering to buy another wide ASSO straps to replace it. The watch is the latest release from HBB V6 factory, which is a big manufacturer in Chinese fake watch industry. 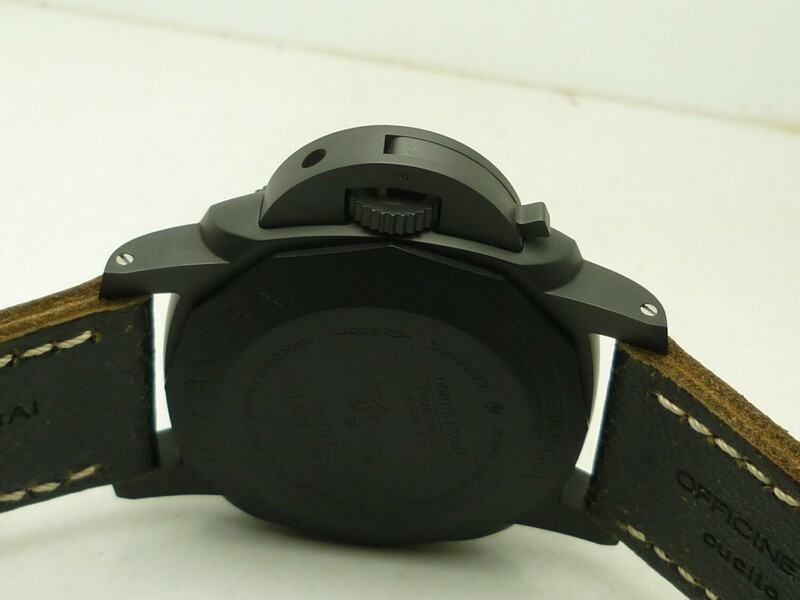 Certainly there are other factories that also make good replicas like PAMs, but the HBB V6(KW) is the one that produces the best Panerai replicas. I do not know too much about this manufacturer, but the pictures tell you how high quality this replica is. 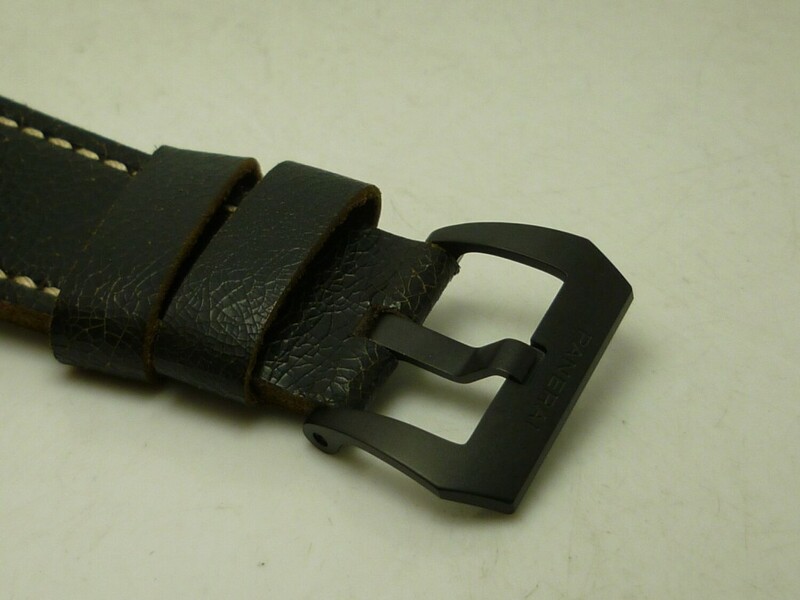 Even I do not like its leather strap, it is a good replica in whole quality. PAM 607 is left handed, which means the watch is to be worn on the right hand, so is the replica, the pictures below show the dial and crown bridge, the simple dial layout and printing make PAM 607 to be easily replicated, and the result is very close to genuine, I have worn it to Panerai boutique and the salesperson even could not tell it is a fake. When getting a closer look, you many find some difference between the genuine, like the thickness of font, the studs on the bezel and markers. I almost forgot to describe the most important of this replica, it is the case, which is real ceramic and has the same structure as genuine, so is the bezel, the ceramic watch brings you somewhat a little cool feeling in hot summer. 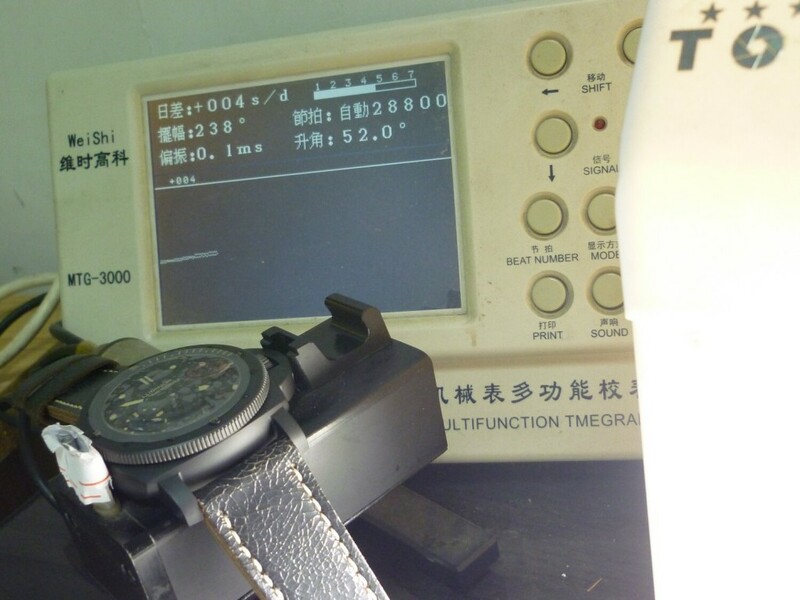 The lume effect of PAM 607 is so strong that is easy to read time clear even in a dark place. The hands and markers are all applied SuperLumed material, like the genuine, the lume lasts a long time. 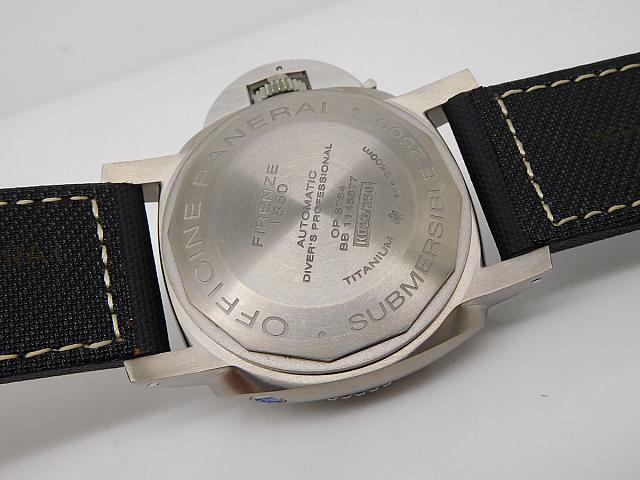 The case back has correct information engraved, open it you will find the beautiful movement, with blue words and Panerai logo engraved on auto rotor and P.9000 engraved on plate, there are beautiful rose red rubies, blue screws and big steel screws fix the movement plates. The steel rim in the case that fixes the whole movement has Geneva Stripes. A perfect imitation of the original P.9000 movement. 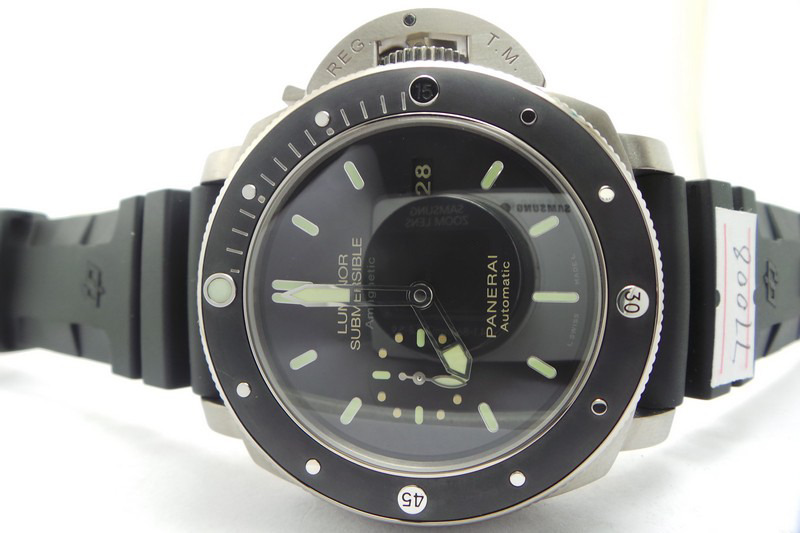 The watch I am going to review is the replica version of Panerai Luminor Submersible PAM 508. 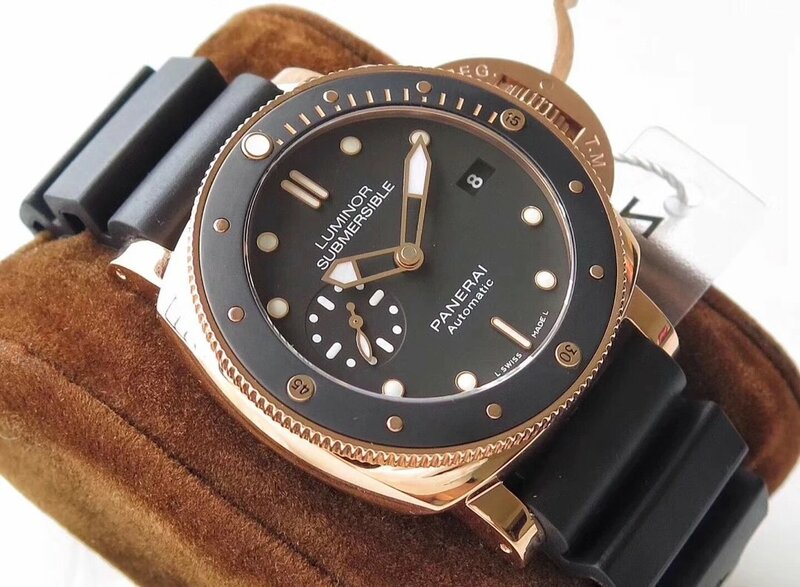 There are several editions in the market, but this one is the best and closest to gen, there are ZF and KW factories manufacturing this replica Panerai PAM 508, there are also DLC version, but this replica is made by KW factory, and they use real ceramic in case and bezel material, this is the real 1:1 full ceramic replica PAM 508 watch. 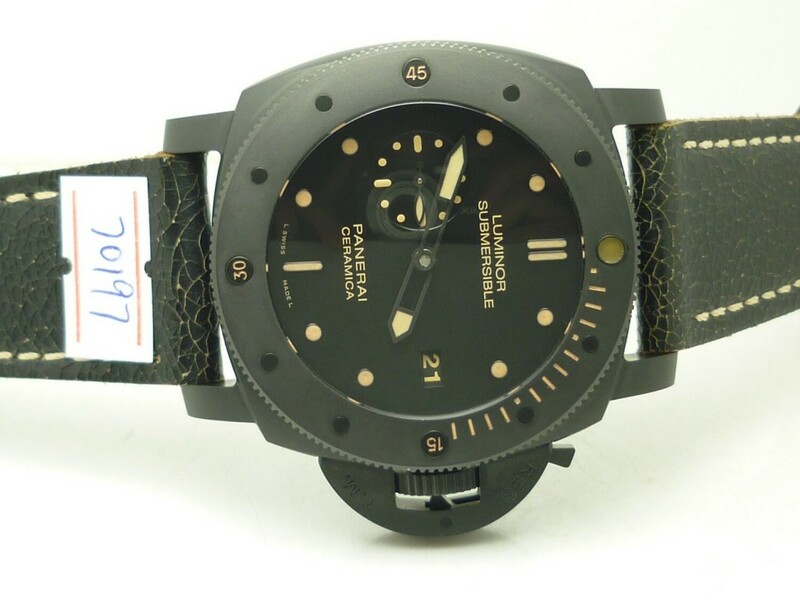 The ultimate version so far, in fact, KW is the factory that makes the best Panerai replicas, so is this one, so you do not need to worry about its quality. Besides the ceramic case, the bezel is also ceramic and you will get a real feeling when rotating it, just like rotate the genuine watch bezel. 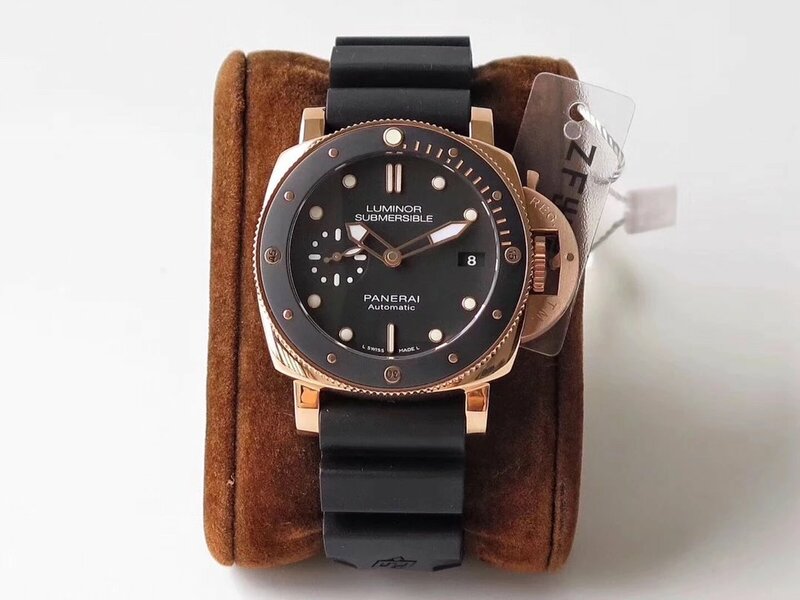 PAM 508 is not the first full ceramic replica Panerai watch KW replicated, before, the factory made PAM 441 and PAM 438, they are all quality replicas. The case is 1:1 replicated from the genuine, besides its ceramic material, it has the same structure as genuine, so is the crown bridge, case back is titanium made, featuring DLC coating like the original. 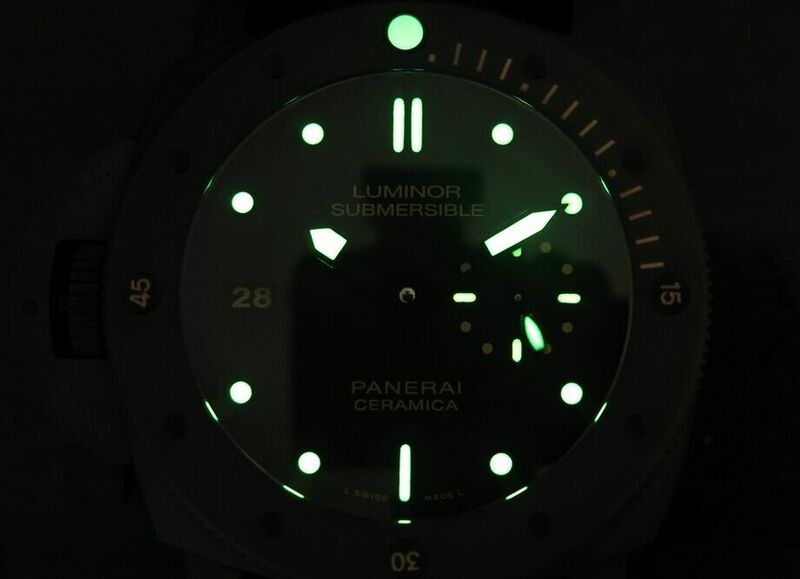 Other low end PAM replicas use poor quality luminous material on dial markers and hands, but this replica uses genuine Super-LumiNova, so the dial lume is authentic, it is bright in the dark. 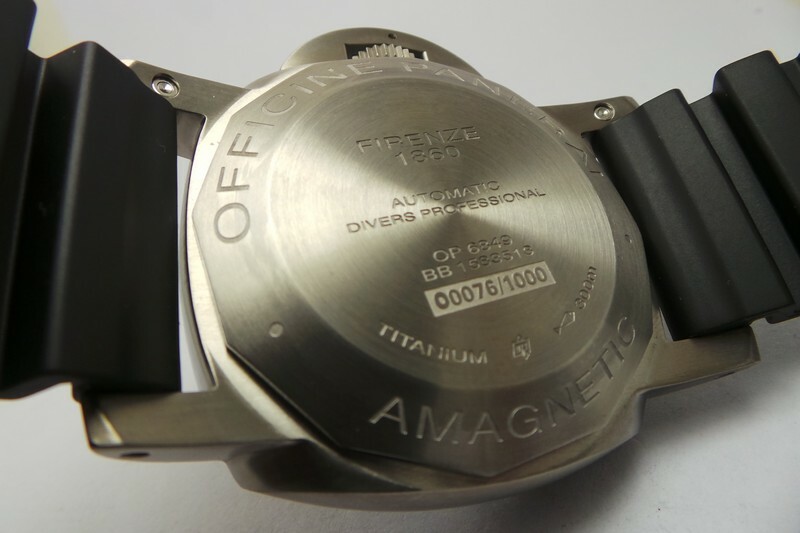 About the movement you guys are mostly concerned, the replica watch is equipped with a clone P.9000 calibre, actually it is modified from an Asian 7750 automatic movement at 28800vph, however, the basic movement is decorated to P.9000 on movement plate and rotor using platinum coating like the genuine. 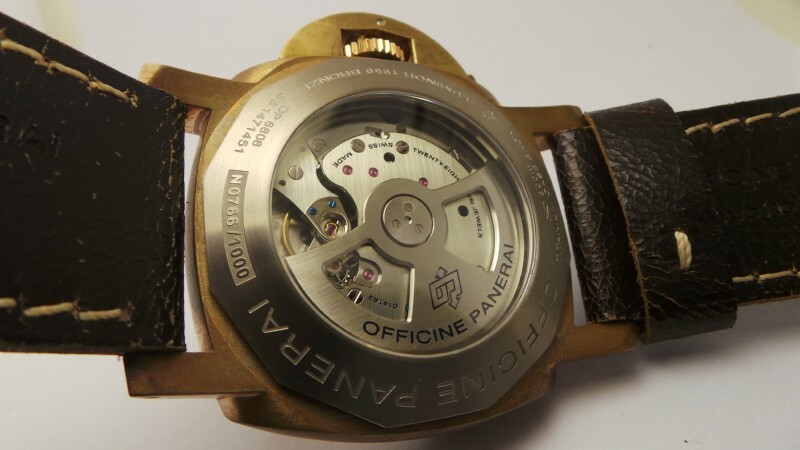 See the testing result of the movement, every data tells it is a stable and reliable movement, so the replica Panerai is worth your money. If you wanna know more about it, such as the price, please leave me comment.